The year is, well, sometime in the middle of the 21st century. The forces of nature have, as per the warnings of damn near every scientist on the planet, wreaked untold damage across our world. Temperatures are soaring, rendering enormous swathes of land uninhabitable. What’s left is wracked by storms on a biblical scale and starved of the resources we once took for granted. That’s right folks, we’re back in post-apocalypse territory. Suddenly it seems that the end of the world is the new zombie outbreak, which was in its own turn the new vampire drama. Everyone wants in on the act and from out of nowhere authors like Peter Heller, Colson Whitehead and now Edan Lepucki are bridging the gap between genre fiction and something which may appeal to the more literary types out there. Book snobs for want of a better epithet. This merging of worlds is certainly possible; indeed Heller’s The Dog Stars is hands-down one of the best post-apoc novels ever penned – insightful, thoughtful, moving and respectful to the genre from which it was birthed. Can the same be said for Lepucki’s debut, California? Well, nope. But read on, because just because it didn’t work for me doesn’t mean it might not be worth your time. Frida and Cal (the titular ‘California’, a university in-joke) are among the survivors of our planet’s steady and alarmingly rapid descent into unlivable chaos. The best chances for making a stand are either own one’s own wits or as part of one of the almost mythical Communities. Reservations for the super-rich, these gated islands of civilisation are self-contained biospheres, housing their paying inhabitants in the manner to which they have grown accustomed without a care for the steady degradation of the world around them. Cal and Frida are not rich. Packing all they can carry into a couple of bags, they head for the wilderness where they can use Cal’s agricultural know-how to build something resembling a life for themselves. You just know a set-up like this is not going to last. Before long Frida is becoming bored of the isolation and going stir-crazy in their makeshift cabin. Forever brooding on the death of her brother Micah, a suicide bomber railing against the exclusionary actions of the Communities – not to mention the fact that she may be pregnant – it’s clear that something is going to snap. And before you know it there’s the triple whammy of a tragedy striking nearby, Frida revealing more than she planned to the mysterious travelling salesman August, and the revelation that their neck of the (literal) woods isn’t quite as deserted as they had once believed. Their lives are turned upside down in a matter of days and they are forced to come to terms with their respective pasts and figure out what their true desires for the future are. Now that I write it down it seems like a truly promising set-up for an exploration of the post-apocalyptic world and the strains which it puts on relationships, communities and mental health. And okay, I’ll be fair, it actually does just that. 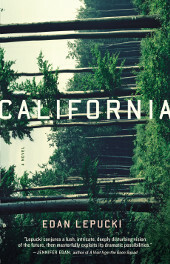 California is a very accomplished piece of work, especially for a debut novel, and Edan Lepucki proves herself an adept at constructing both rich, substantial worlds and strong, believable characters. I found myself sucked in very quickly and by the time I was 100 pages in I was devouring the book at an unexpected rate. But then the last act happened. I can’t pinpoint the precise chapter when it turned but suddenly I realised that I wasn’t reading a sci-fi dystopia any more. No, instead I was plodding through an old-fashioned mystery/drama with a ruined world lurking in the background as a McGuffin. The devastation was suddenly bereft of all purpose beyond that of window dressing. Instead of contemplating the wider issues of the politics, sociology and environment in the aftermath of the collapse I was getting mired down in a bout of finger-pointing, questions no grander than which specific character did what to whom and why. Like I said at the start, your mileage may vary. I honestly don’t mind the human drama. It’s a driving force behind all the greatest works of fiction and a novel would be truly barren without them. However I do feel kind of cheated when a book spends its bulk hinting towards grander issues (the Group versus the Communities! An epic battle of ideologies! ), only to abandon them by the wayside in favour of what boils down to a murder mystery and some family bickering. That said, if you’re not a die-hard genre fan and would like to get into the doomsday buzz then something like California could be the ideal introduction. Give it a blast, just be wary of what you’re getting into before you get your hopes up.